The announcement of the new working group was among the key recommendations outlined by industry experts who participated in a panel discussion recently held as part of Dubai Startup Hub’s Entrepreneurship Advocacy Series. 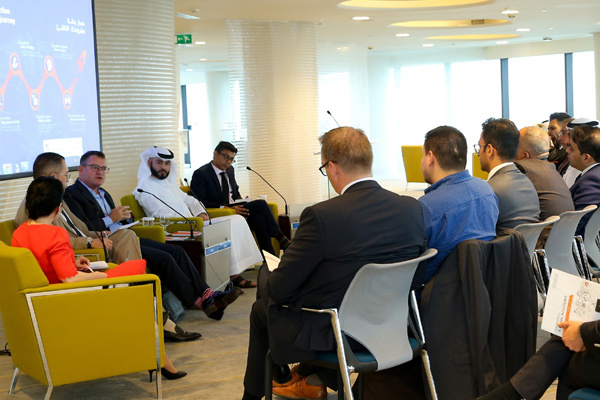 The event, hosted at Dubai Chamber’s premises, was attended by representatives of the UAE Ministry of Economy, leading UAE banks, heads of licensing authorities, local incubators, startups and SMEs. Dubai Startup Hub, an initiative of the Dubai Chamber of Commerce and Industry, is organising the Entrepreneurship Advocacy Series with the aim of fostering an open and constructive dialogue between various stakeholders, facilitating private-public sector cooperation, and developing practical solutions to existing challenges facing SMEs and startup. During the event, panellists reviewed the findings of a recent study conducted by Dubai Chamber in coordination with the UAE Ministry of Economy, the UAE’s Council of Small and Medium-Sized Enterprises and global consultancy firm Roland Berger, and shared their insights on various issues, including access to finance and banking services, regulatory requirements, and the need for digital solutions. The process of opening a bank account was highlighted as an area that needs improvement as panellists noted that it can take up to three months for SMEs and startups to set up a bank account. Required procedures were described as complicated and lengthy, while the need for better guidance from banks was noted. Regulatory pressures and strict standards were identified as the main factors that have limited progress in these areas, while other customer segments are often seen by industry players as more commercially attractive than SMEs and startups. Hamad Buamim, president and CEO of Dubai Chamber, noted that the Chamber is committed to ensuring a favourable business environment in Dubai that remains conducive to growth, and stressed the important role that SMEs and startups play in supporting the economy and fostering innovation. Buamim said the recent study on SME banking challenges conducted by the Chamber provides more clarity on existing obstacles and enhances transparency within the business community, adding that the Chamber will plan to conduct research on other important matters impacting SMEs and startups, and aim to identify tangible solutions that address such challenges. Neil Petch, chairman of UAE company formation specialist Virtuzone, explained that opening a corporate bank account can be a challenging process for entrepreneurs in the UAE, which can often lead startups to look elsewhere to set up their businesses. “We welcome the report’s call to make the account opening process ‘simple, transparent, and fast, while meeting compliance needs’. To maintain the UAE’s image as a country that is open for business, we also fully support the Dubai Chamber’s suggestion that banks publish a clear, readily available, step-by-step guide to provide transparency on the banking process, timing and documents required to open an account,” said Petch. Sassan Hatam, Partner, Roland Berger and co-author of the study, recommended to explore options such as introducing a basic no-frills bank account, creating one-stop solutions for trade licence and bank account, or digitalising the end-to-end account opening process. This could help the UAE become a showcase for global best practice when it comes to opening a startup bank account.